Representative Honours: Ireland: 15 Caps / 4 Goals (1947-1957), Junior, Schoolboy; Northern Regional League: 2 Caps / 2 Goals (1947). Club Honours: Northern Regional League Champion 1946/47; Irish Cup Winner 1946/47; Gold Cup Winner 1946/47. A star at intermediate level for a number of seasons, including a spell with Linfield Swifts, Eddie McMorran made the breakthrough to senior football with Belfast Celtic. In the 1946/47 season he scored well over fifty goals, including thirty in 24 Regional League games, as Celtic claimed the League title, Irish Cup and Gold Cup. He was rewarded for his fine form with an Ireland cap against England and Inter-League caps against the Football League and League of Ireland (both games in which he scored). A blacksmith by trade, McMorran was a strapping centre-forward, using his strength to great effect. Signed by Manchester City in July 1947, McMorran’s goal return, while respectable, was not quite what was hoped for. After a year-and-a-half at Maine Road he moved on to Leeds United. It was hoped that his goalscoring abilities would bring top-flight football back to Elland Road, but once again he failed to shine as Leeds wallowed in mid-table. Leeds recouped the £10,000 fee that they had spent on McMorran when he was sold to Barnsley in the summer of 1950. Although his scoring feats still didn't hit the levels he had attained with Celtic, McMorran established himself as a popular player at Oakwell. He also regained his place in the Ireland team for the first time in four years, marking his return with a goal against England. He remained Ireland’s first choice number nine for the following three years. 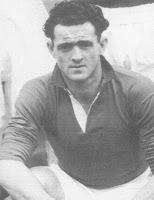 Mid-way through the 1952/53 season, with Barnsley struggling at the foot of the table, Peter Doherty stepped in to make McMorran Doncaster Rovers' record signing. At the time Doncaster, with McMorran the star, were consistently punching above their weight as an established Division Two side. In 1954 they embarked on an FA Cup run to the fifth round for the first time, dispatching big-spending Sunderland along the way – McMorran scoring twice in a 2-0 win. They repeated their FA Cup heroics in the next season, dispatching Aston Villa in an epic series of matches. In 1957 McMorran won his final two caps in World Cup qualifiers against Italy and Portugal. By the time of the Finals in Sweden he had left League football behind, settling in Yorkshire. He retained an active interest in local football for a number of years, playing and coaching in non-League circles. Later McMorran returned to his native Larne where he passed away, at the age of just sixty, in 1984. Summary: 15/4. Won 1, Drew 3, Lost 11.